The following is a guest post from Karen Mesoznik at SaferVPN. 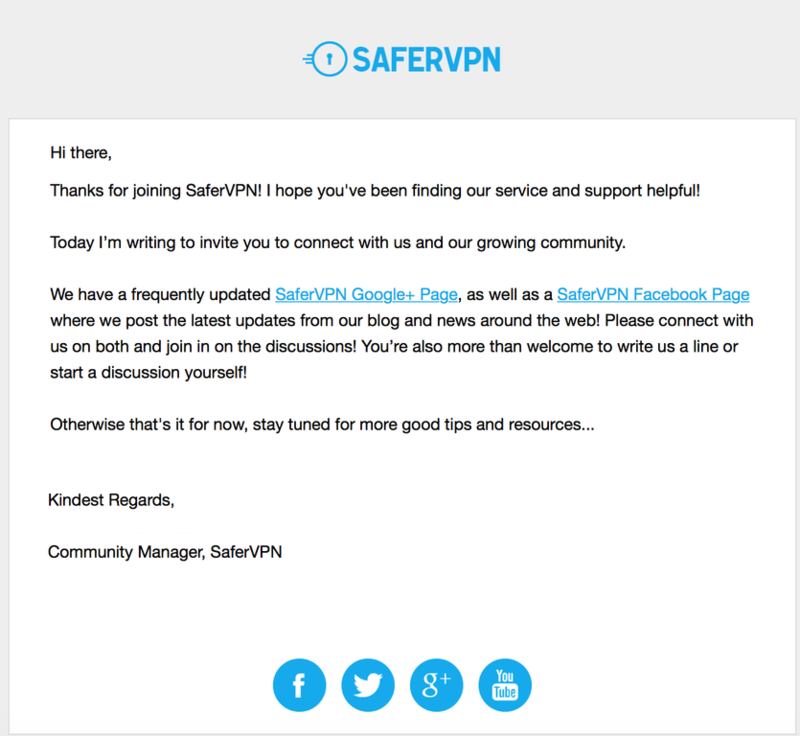 Learn more about Karen and SaferVPN at the bottom of this post. An email from your founder can be one of the most important emails for your business—a true reflection of your company and company values. 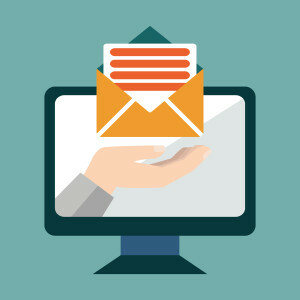 It’s a unique chance for your customers to hear how important and valued they really are, and to connect with the leader of the business, but it’s not as easy to write as it would seem. We’ve had some phenomenal success with our email from the founder, including a 60% unique open rate and high engagement level (as in dozens of email responses a week). We want to share our valuable insights with you, in hopes that you’ll experience the same results that we have. “The minute we started sending this out, the return emails started flooding in. 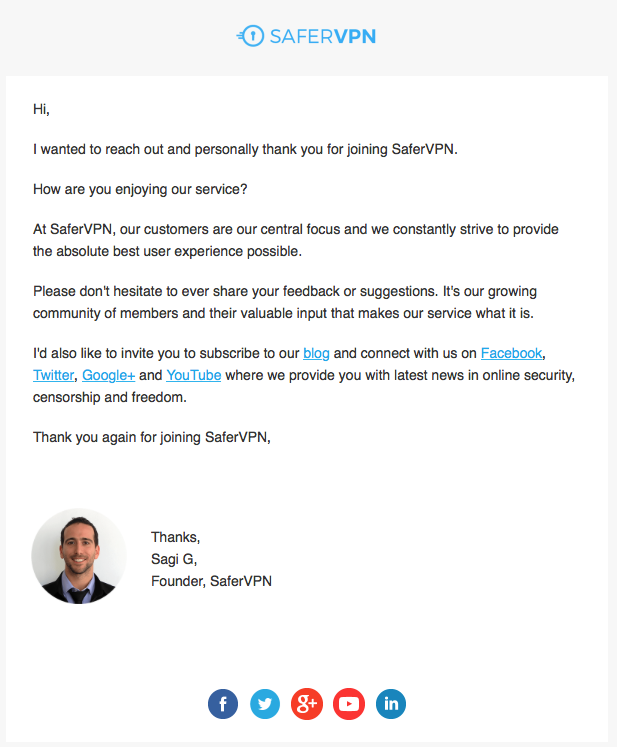 This single email has been an incredible tool in my ability to reach out and really connect with our customer base,” says Sagi Gidali, Co-Founder of SaferVPN. The story begins two months ago, when we decided to do a sweeping remodel of our entire email funnel. We knew this renovation needed to include a powerful and personal email from one of the co-founders, to really speak to the customers on a level we had not before. Ok, so what did we do wrong? Well, for starters, aside from the visual aesthetics, the subject line is rather bland. It doesn’t entice or pique your interest. The next mistake we made is that we didn’t engage our customers with any questions. We wrote to thank them for joining our service, but we didn’t bother to ask them how they are enjoying it. Not so polite, wouldn’t you agree? Then we have a big chunk of intimidating and somewhat redundant text. And while the tone is welcoming, we don’t really make the customer feel appreciated—why again do they want to connect with us and follow us on other platforms? The last mistake, may be among the most crucial. We sent this email from the Community Manager, not the founder. While emails from staff are excellent as well, there should be at least one email from the founder. The reasons are obvious: who as a customer doesn’t feel special when the person who actually created the company reaches out to them? So, let’s talk about what’s right. First of all: the subject line includes an element of intrigue and curiosity. Rather than just say, “Welcome from the Founder” we say “A Question from the Founder.” So of course, our customers are left thinking: “What exactly is the Founder’s question? What does he/she want to say?” And then click, open. But the journey doesn’t end there. Now, we engage them with the text. First of all, we reiterate that the founder is taking his time to personally reach out to the customer and, we thank them. “Thank you” goes along way with your customers. And as a founder, before you begin writing anything else, you should thank your customer first and foremost for choosing your business. Then, we immediately engage them with a question. We want to know: are they enjoying the service so far? We also make them feel more than welcome to share any feedback or suggestions they may have. And finally, after all that is said and done, we invite them to connect with us on all our social platforms, with the promise of exciting content, to be exact: “the latest news in online security, censorship and freedom.” And lastly, a parting thanks to seal the deal. After this email, what customer wouldn’t feel special? And that brings us to the bottom line (literally), the secret to crafting the perfect email from the founder isn’t about the founder— it’s about the customer. Make sure your email from the founder is about them and they will gladly pay attention to you. Karen Mesoznik is the Inbound Marketing Manager at SaferVPN, a fast-growing premium VPN (Virtual Private Network) service. SaferVPN provides online security, privacy and freedom to hundreds of thousands of business leaders and consumers worldwide. With more than 150 servers in 24+ locations, SaferVPN allows businesses to achieve competitive market insights, optimize advertising efforts and safeguard sensitive company data online. 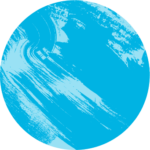 SaferVPN is known for leading the industry in simplicity and ease-of-use, offering one-click applications for Mac, Windows, iOS, Android and Chrome, as well as customized white-label business solutions.